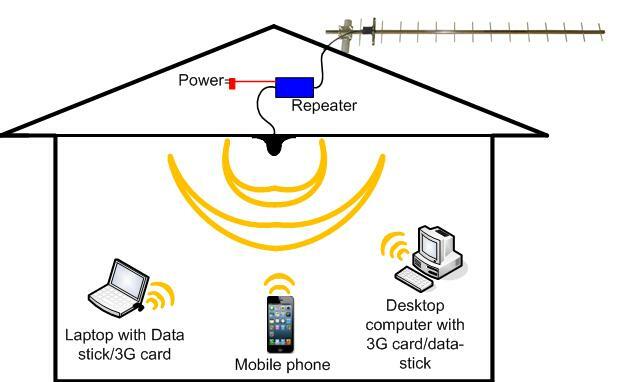 The most common active repeater in NZ for Spark, Skinny, 2Degrees, and Vodafone is the Cel-Fi unit, shown in the diagram below. This is the easiest to set-up and works well. To buy a Cel-Fi unit, ($1,448.43 for Spark; or $1515.47 2Degrees or Vodafone including GST) simply click on the shopping cart item below and you will be away. If you don't want to spend that much, consider one of our passive repeaters (they are half the price). Once you hit the Buy Now Icon below, the process is as follows. You click on the BUY NOW below. You then enter your details such as name, address, etc. We then receive your details, pre check your location, and send you a quote for the equipment. If you're in a marginal area, we recommend adding an external antenna to improve signal and coverage. Once they give approval, the kit is sent to you, and if you have any problems setting it up we will help you through this. We have been selling 'active' repeaters since we started in 2002, but only to the licensed Cellular Carriers in NZ, Spark, Vodafone and more recently 2Degrees. The Cellular Carriers own the radio spectrum and therefore control the use of repeaters. As such authorisation from the Cellular Carrier is necessary before we can sell a repeater in NZ. In NZ, if you install a repeater (and by the way this includes any vehicle cell phone amplifiers) and it is not licensed you are liable for prosecution by the spectrum owner. The reason for this is in today's technology the mobile phone networks are very sensitive to noise or interference, which can be generated by unlicensed repeaters or vehicle amplifiers. Since we started over 13 years a go we have seen first hand how illegal non-licensed units damage the mobile phone network(s) and cause other customers to lose coverage and drop calls. We don't sell and have never sold vehicle amplifiers for cell phones. Irrespective of what people say these do not work, and will only show increase in signal due to noise. What actually improves performance is the connection of the antenna to the vehicle not the illegal noise generating amplifier. If you are reading this you are probably interested in an active repeater for your home or office. To date we have authorisation from Spark, Skinny and 2degrees mobile NZ to sell two types of active repeaters to the public. This is great news as it helps prevent illegal repeaters being installed by the public and damaging the mobile phone networks. Our repeaters have automatic gain control to stop any interference and are band specific for just the Spark, Skinny and 2degrees spectrum (this is very important to ensure interference is not generated to other users which is the primary problem with non-approved units obtained from overseas). How does a fixed install repeater work? At Cellutronics, we are also a licensed supplier to sell fixed install repeaters for 2Degrees customers and Vodafone customers. Fixed units are more designed for commercial applications that require tougher environments, such as meatworks, refrigeration, assembly and fabrication plants etc. If you want to know more about these please contact us (the picture at the bottom of this page is a fixed install unit). Please don't be fooled by other companies selling cheap units that look like this. (Approved fixed repeaters for 2Degrees only or Vodafone only) Refer to the diagram below. In summary it takes the signal from outside on your roof and re-transmits it inside your house through the indoor omni thereby typically providing good coverage and data speed throughout your home or office. 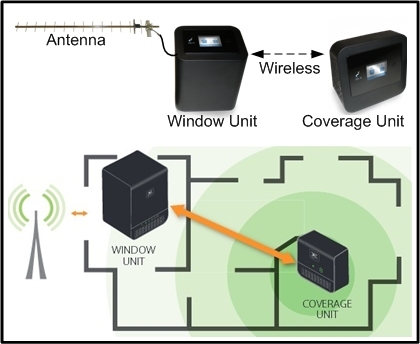 Our repeaters use automatic gain control to ensure interference is not generated to other users in the area.